Outstanding English animal painter and anatomical draftsman. The son of a prosperous tanner, Stubbs was briefly apprenticed to a painter but was basically self-taught. His interest in anatomy, revealed at an early age, became one of the driving passions of his life. His earliest surviving works are 18 plates etched for Dr. John Burton s Essay Towards a Complete New System of Midwifery (1751). In the 1750s Stubbs made an exhaustive analysis of the anatomy of the horse. He rented a farmhouse in a remote Lincolnshire village, where, over a period of 18 months, he undertook the painstaking dissection of innumerable specimens. After moving permanently to London in 1760, Stubbs etched the plates for Anatomy of the Horse (1766), which became a major work of reference for naturalists and artists alike. 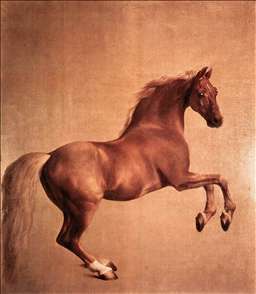 Stubbs soon established a reputation as the leading painter of portraits of the horse. 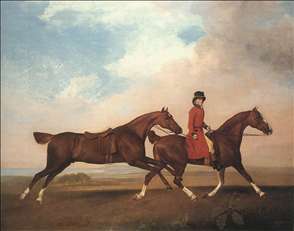 His masterly depictions of hunters and racehorses brought him innumerable commissions. 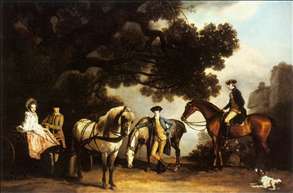 Perhaps more impressive than the single portraits are his pictures of informal groups of horses, such as Mares and Foals in a Landscape (c. 1760-70; Tate Gallery, London). Stubbs also painted a wide variety of other animals, including the lion, tiger, giraffe, monkey, and rhinoceros, which he was able to observe in private menageries. According to the artist Ozias Humphrey, Stubbs was so convinced of the importance of observation that he visited Italy in 1754 only to reinforce his belief that nature is superior to art. 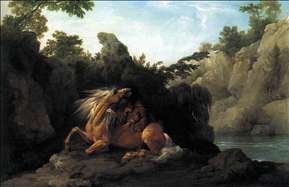 Among Stubbs s best-known pictures are several depicting a horse being frightened or attacked by a lion (Horse Frightened by a Lion, 1770) in which he emphasizes the wild terror of the former and the predatory power of the latter. 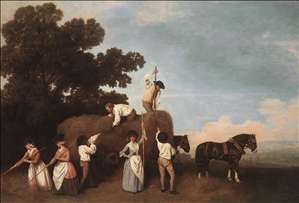 Stubbs s historical paintings are among the least successful of his works; much more convincing are his scenes of familiar country activities done in the 1770s. Unfortunately, he tended to execute his paintings in thin oil paint, and relatively few survive in undamaged condition. In later life Stubbs knew considerable hardship. His last years were spent on a final work of anatomical analysis: A Comparative Anatomical Exposition of the Structure of the Human Body, with that of a Tiger and Common Fowl, for which he completed 100 drawings and 18 engravings. The Anatomical Works of George Stubbs was published in 1975. See more details about "William Anderson with Two Saddle-horses"
See more details about "The Milbanke and Melbourne Families"
See more details about "Haymaking"
See more details about "Lion Devouring a Horse"
See more details about "Whistlejacket"